1. You dive with a loved one! 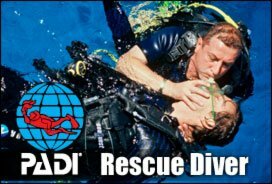 Do you dive with your spouse? Your kids? A close friend? What if something goes wrong? Be prepared. Be safe. Have fun. 2. Learn to be a better buddy. Every certification prior to Rescue is self-focused. The Rescue Diver course teaches you to not only help yourself, but to help others. 3. Challenge yourself. This course will challenge you both mentally and physically. When is the last time you challenged yourself? The Rescue Diver eLearning is designed for self study prior to the first night of class. There will be two pool sessions to prepare you to deal with dive emergencies, minor and major, using a variety of rescue techniques. The open water training is compromised of open water dives conducted over a one day period. Feeling of increased confidence and competence in your diving abilities enhance the pride of completing the Rescue Diver course. It also qualifies you toward your first step at the challenging and satisfying level of Divemaster or Master Scuba Diver. Come join us at One World Dive & Travel and enjoy the benefits and rewards of becoming a certified Rescue Diver. PADI Advanced open water certification or equivalent. EFR or equivalent First Aid/CPR in the last 24 months. Once you register for class, we'll send the Rescue Diver eLearning code so you can start studying today! Materials Included: Includes pool session, open water dives and rental of tanks and weights.